You pre-register to receive an invitation to bring an art car to the event. That’s right. Wanting to bring an art car is not enough, and after pre-registering you might not get invited. Here are some examples of art cars there were not invited. Assuming that you get invited, then . . .
You build your art car. You transport your art car to Burning Man. If the art car cannot drive on public roads, then you’ll need to transport it on a trailer. At Burning Man, you get your art car inspected, and the DMV issues you a license to drive during the event. However, even though you received an invitation, you might not get a license (although if you do everything that you said you would do in your application, then you probably will get some kind of license). Finally, you’ll need to have enough fuel for your vehicle. You can buy fuel on-site, but the line can be very long (literally hours). All of these requirements become design constraints for the art bicycle. 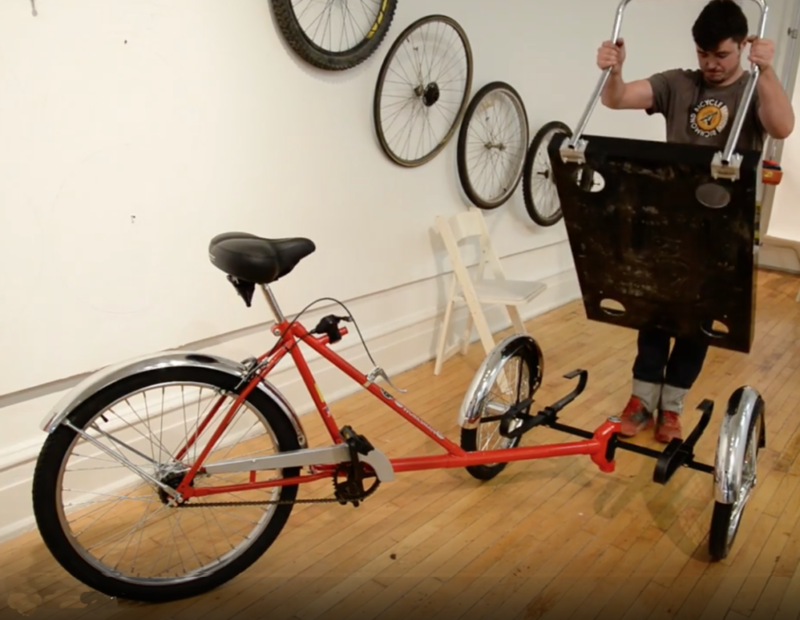 I’m going to construct the art bike on a front-loading industrial tricycle. At this point, I’m considering using a Worksman Cycles Model STPT. This really is quite a sturdy vehicle. It has a rider+cargo capacity of 500 lbs. It’s easiest to replace the rear wheel of the trike with another wheel that has a hub motor. Grin Technologies has hub motors, controllers, and other accessories. They even will build a wheel for you from their hubs and rims. I’ll need a battery. Lithium-Ion batteries for ebikes are available, but they are expensive. Instead I’ll build my own using cells and a battery management system. Pacific Ave Cycles donated a couple of used 36-volt batteries, each of which has a few bad cells. I’m testing all of the cells, and if I discover that there are enough good cells for a single working battery, then I’ll make one. I can use that battery for initial testing (and perhaps for later use as a backup battery), but my plan is to build another battery entirely from new cells. I’ll also need a charger. The folks at Grin Technologies have a few alternatives that are inexpensive or flexible. With a rider+cargo limit of 500 lb, I need to keep the decoration lightweight. I can do that by copying the construction techniques of old airplanes and using lightweight materials: spruce and fabric. Since I’m not making an airplane, I don’t need to use FAA-certified materials and techniques. Instead, I’ll make a custom frame from whatever materials seem appropriate, and then I’ll staple various colors of vinyl-coated Naugahyde fabric on the frames. The STPT trike has leaf springs, and I’ll use 2″ closed-cell foam padding for the seat. So the passenger seating will be comfortable. The frame that supports the seat will use 4130 steel tubing. The frames that support the walls will use a combination of metal tubing and spruce. I’d like to include a small “countertop” that holds the Jukebox controller. I can use Formica or Wilsonart laminate for the countertop’s surface and surround it with vintage aluminum edging. The 1950s saw several color schemes. I like the turquoise/red one. (Do an image search on “1950s diner”.) 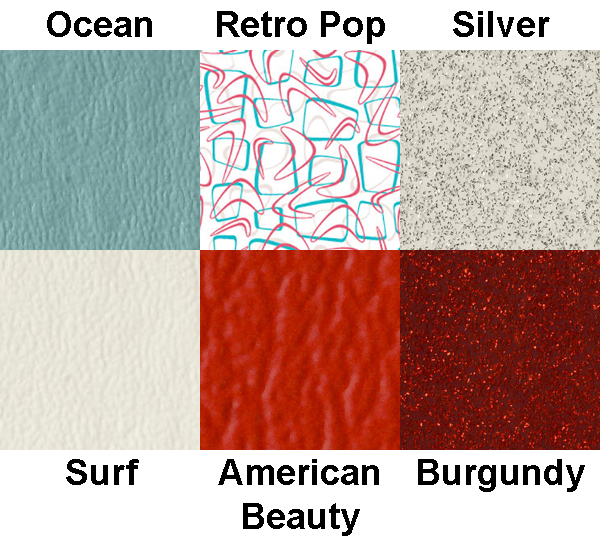 Fortunately, Wilsonart offers a laminate with turquoise and red called “Retro Pop.” And Naugahyde offers several fabric colors that look good with this laminate. Here are my selections for the Retro Pedicab. The Ocean, Surf, and American Beauty fabrics will be used for walls. The Burgundy and Silver sparkle fabrics will be used for upholstery. 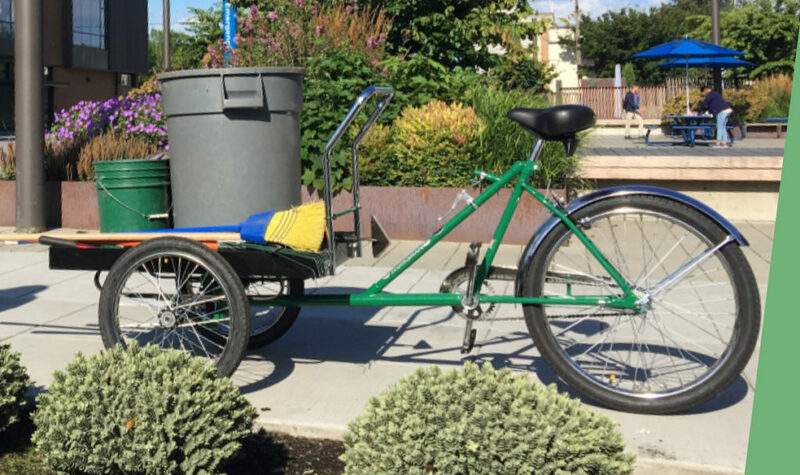 All of these materials are intended for indoor use, but the pedicab will be used outdoors. Fortunately Burning Man lasts only about a week!